I have spoken to sufficient photographers to realise Lightroom is like Marmite; you either love it or hate it. What’s interesting though is that many of the people who “hate it” do so because they struggle to understand its purpose. Why does it exists and why it it separate to Photoshop. If you find yourself confused by Lightroom, this two part Lightroom course should help. Be sure to also read the second part of the course which covers other elements of Lightroom. Import image from your camera to a central database or library where they can be stored for future use. Review and rate the images in the library so the best images can be identified for further work. Store information about the images e.g. location and descriptions so the library can be searched quickly identifying images that match a requirement. Process selected images ready for use as well as keeping track of different versions of the same image. Share finished images with others as a screen show, on the web or in print. Lightroom provides great flexibility and power built around the idea of a simple generic workflow. If you compare this to Photoshop, it is aimed very much at image editing with limited capability to add keywords and output work to the web or in print. The difference with Lightroom is that it provides great tools to support every step of the workflow rather than being exceptional in just one aspect. Let’s turn our attention to each of the steps in our workflow and how Lightroom can support us. Open Lightroom then plug your media card into the card reader attached to your PC. Select [File | Import Photos...] from the menu. It is possible to configure Lightroom to display the import dialog (see the illustration below) when a new media card is detected so this step may not be required. When the Import dialog is displayed it will have the “Source” from where the files are to be imported, on the left side. Select your media card and folder from the list. The files on your media card will now be displayed in the central part of the screen. On the right hand side of the dialog there are a number of options (which we will discuss shortly). The most important thing you need to do at this point is select the “Destination” to which the new files will be copied. When you have done, click the Import button to start the import process – except don’t do this yet as you might want to review some of the other options available to you first. There is an option on the right hand side of the Import dialog that tells Lightroom “Don’t Import Suspected Duplicates”. When this is selected Lightroom does a check of the files selected as the Source and automatically removes these from the display of selected Thumbnails. 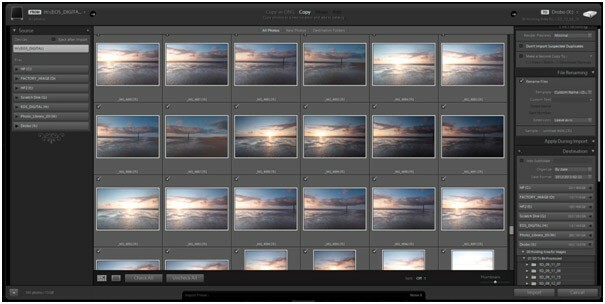 By importing through Lightroom as mentioned above you can select to automatically create a duplicate of the file to a second location which might be a backup hard drive. Activate this by ticking the “Make a Second Copy To:” option and then select your location. You can automatically rename your images as they are imported. I tend to rename all my images so that they start with my name, then the camera model e.g. 5D and then the year and month they were shot e.g. RWhalley_5D_2012_02_ followed by the file name. You can apply development settings as the files are imported. These are the development settings that you have in the “Develop” module of Lightroom and which we will cover later. And my favourite, you can automatically apply Meta Data to the files as they are imported. This is information such as your contact details and copyright notice and ensures all the files you produce will carry this important detail. In fact I think this is so important I’m going to show you how to do it next. Before you can do this you will need to close the Import dialog if you have this open. Select [Metadata | Edit Metadata Preset...] from the menu. This will display the presets dialog. Select the Preset you want to use as your basis from the drop down list at the top of the screen. Enter the Metadata that you want to use in your template e.g. 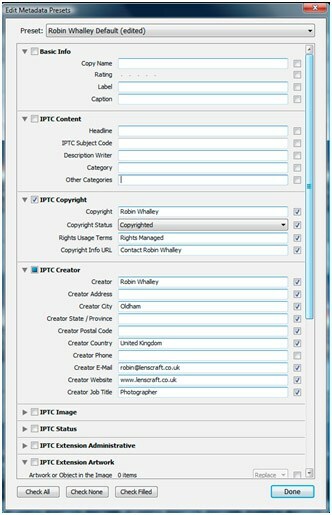 IPTC Copyright and IPTC Creator. In the Preset drop down at the top of the dialog select the option “Save Current Settings as New Preset...”. Give your preset template a new name e.g. “Robin Default Import”. Finally click the “Done” button to close the dialog. You have now created a Meta Data Template that can be selected and automatically applied as part of the Import process. 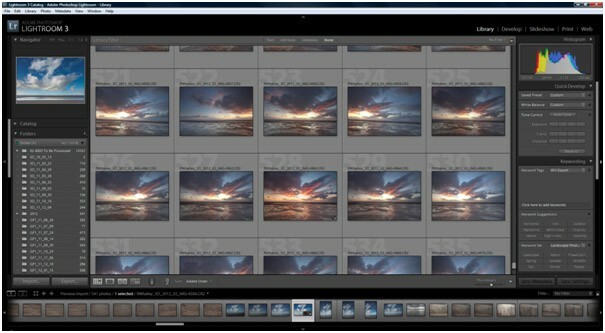 With your images successfully imported to Lightroom it’s a good idea to organise them by rating and labelling them. This is where the Library module comes in as shown below. In the central panel of the screen you can see all the thumbnails of images within your library. To the left hand side there are a number of useful panels. The top panel you can see is a navigation tool for when you switch to a larger view of the currently selected thumbnail (also called the Loup view). This allows you to quickly select an area of the image to view rather than needing to scroll around. Also visible in my screen shot is a list of folders which form part of my library and which contain images. When one of these is selected the images in the folder are displayed as thumbnails on the central panel. Over to the right hand side are a series of panels showing information such as the histogram, IPTC and keyword information. There is also a “Quick Development” tool where you can quickly see basic changes to an image rather than switching to the Develop module. Personally I don’t find this very useful and tend to ignore it. The next step in my Lightroom workflow is to apply a star rating to each image from 0 to 5. I do this based on the more stars an image has, then the better I believe it is (I hope to cover this properly in a future article we are planning). I also apply colour labels to each image once I have applied to keywording to indicate what use I am putting it e.g. I am sending it to a Stock Library, it is exclusive to a particular client etc. Hover your mouse cursor over a thumbnail and to the bottom left you will see 5 dots appear. Clicking on these allows you to apply a number of stars to the image. If you have multiple images selected and repeat the above step you will apply the same star rating to all the images. You can also right click on an image or a group of selected images and chose to apply a star rating from the popup menu using the “Set Rating” option. There is also the spray painter tool that allows you to paint star ratings to images. This is found on the toolbar immediately below the thumbnails and looks like a paint spray can. When you click this you pick up the spray can and a small fly out menu appears to the right of the space where the can was located. Click on this and you can select to use the spray can with star ratings. Now when you click on a thumbnail you will paint the star rating to the image. When you are done, click on the empty space where the can was located to return it. The spray can is a very useful tool that can be used with a number of image attributes such as keywords. To Label an image just right click on the image and select “Set Color Label” from the menu. As you do you will see the label options available for selection. You can also use the other methods described above e.g. right click with multiple images and spray. In the next part of this learning Lightroom course we will look at Keywording, Developing and Outputting your images.